U.S. crude oil stockpiles post their largest decline since July 2018. Global stockpiles have fallen by 40 million barrels since January, JBC Energy estimates. Supply cuts led by OPEC and U.S. sanctions against Iran and Venezuela continue to support prices. 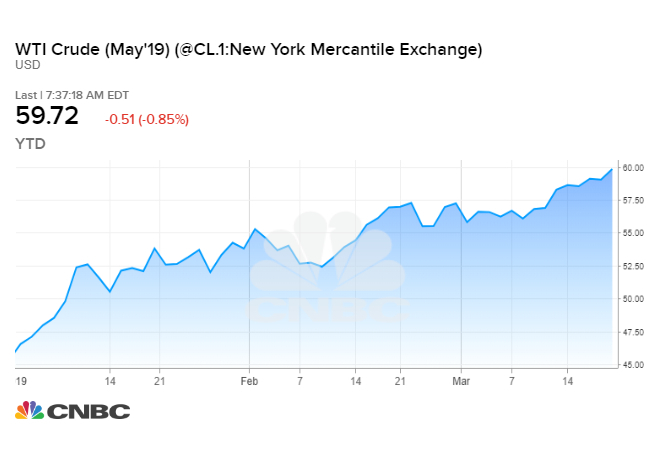 U.S. West Texas Intermediate crude futures ended Thursday's session 25 cents lower at $59.98 per barrel, marking its highest settle since Nov. 9. WTI reached its highest intraday level since Nov. 12 earlier in the day, at $60.39. International Brent crude oil futures were down 47 cents at $68.03 a barrel around 2:25 p.m. ET (1825 GMT), having hit their highest since Nov. 13 at $68.69 earlier in the session. That followed a nearly 10-million-barrel fall in U.S. crude stocks last week, the largest drop since last July, boosted by strong export and refining demand, according to the U.S. government's Energy Information Administration. Meanwhile, OPEC's crude output slumped from a mid-2018 peak of 32.8 million barrels per day (bpd) to 30.7 million bpd in February. The U.S. sanctions are disrupting supply. OPEC's crude output fell from a mid-2018 peak of 32.8 million barrels per day (bpd) to 30.7 million bpd in February. U.S. sanctions are disrupting supply. U.S. crude production returned to its record of 12.1 million bpd last week, making America the world's biggest producer.